We in Akbayan Party welcome the Supreme Court's reversal of its previous ruling on the Hacienda Luisita case. It is a great victory not only for the beneficiaries but also for every Filipino farmer. Now it is crystal clear, land distribution is the sole, genuine avenue of agrarian reform. Likewise, this decision affirms the Comprehensive Agrarian Reform Program- Extension with Reforms (CARPER) - farmers must own the lands they till and it is the onus of government to guarantee it. Lastly, and yet again, we call the attention of the Supreme Court for its propensity to issue decisions of great dissonance to the people's welfare. Lest we forget, before this reversal, the high tribunal disapproved the SDO in Hacienda Luisita only to mind-bogglingly call for a referendum among HLI farmers to help them “decide” whether they want the SDO or land distribution. The same confusing decisions were also seen in the high tribunal's flip flopping on the FASAP retrenchment case and most recently, in its issuance of an ineffective temporary restraining order on the watchlist order against the Arroyos. The Supreme Court must immediately reform itself if its wants to retain its credibility and legitimacy. 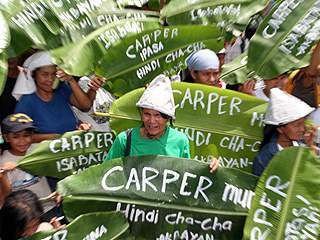 It can start by apologizing to the public beginning with the Hacienda Luisita farmers.